2 To make the stuffing, place all ingredients into a large bowl and mix together well. 3 Remove strings from the joint if it is strung, open joint and lay flat on a board, fat side down. Place the stuffing on to the lamb. 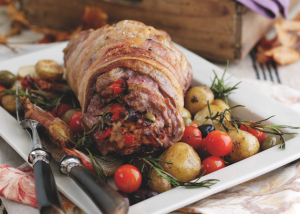 Fold and roll the lamb and tie with heat-resistant butcher’s string. 4 Weigh the joint and calculate the cooking time: 25 minutes per 450g/½kg (1lb) plus 25 minutes. Place the joint in a roasting pan and season. Baste the lamb during cooking. 5 On a separate tray, place the olive oil and new potatoes, season, toss together to coat in oil and then spread out in a single layer. Roast for about 40 minutes until potatoes are tender. Add the cherry tomatoes and olives and cook for about 5-10 minutes until tomato skins start to split. 6 Carve and serve the lamb with the roasted new potatoes, roasted tomatoes and olives.